What is the Archive List? 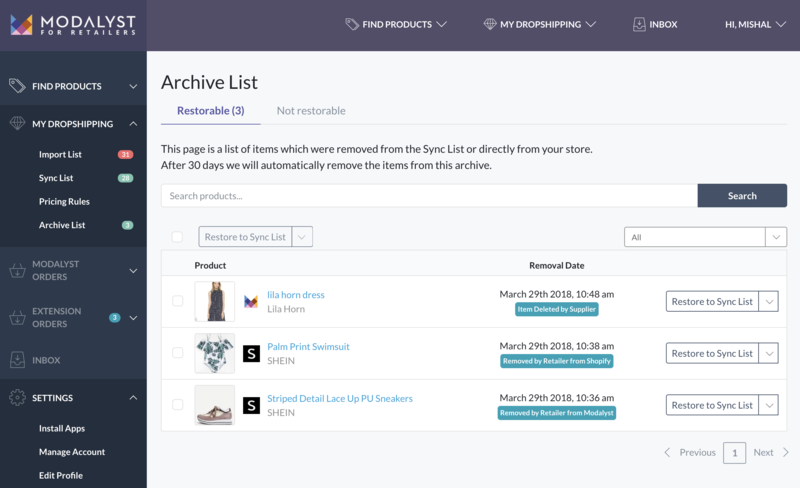 The Archive List is a list of all products that have been removed from your store. You can re-add products from the Archive List at anytime to either your Import List or your Sync List. Included in the Archive List is the reason why the item has been removed. Please see below for explanations on all reasons listed. Items Deleted by Supplier : Supplier deletes the item from their collection on Modalyst. *Please note that if the Supplier simply removes the item (not deletes) from dropshipping, it will be listed in the "Unpublished" section. Removed by Retailer from the integrated store : The Retailer removes the item directly from Shopify / BigCommerce. Removed by Retailer from Modalyst : The Retailer removes the item on Modalyst by going to the Sync list and clicking "Remove Item from Store"
To restore the items to your Sync List, simply hit "Restore to Sync List"